What is the difference between YOU’RE and YOUR? You’re and Your sound the same in English. Words that sound the same are called homophones. What is the difference between Your and You’re? YOUR = a possessive adjective. It shows possession, that something belongs to the person you are talking to. My book, Your book, His book, Her book. You have a book. Your book is new. This is not my book, it is your book. YOUR can refer to a thing (or person) that the other person has. Friend and mother are NOT possessions! They are something that you have. In this sentence, we can replace You are with the the contraction You’re. 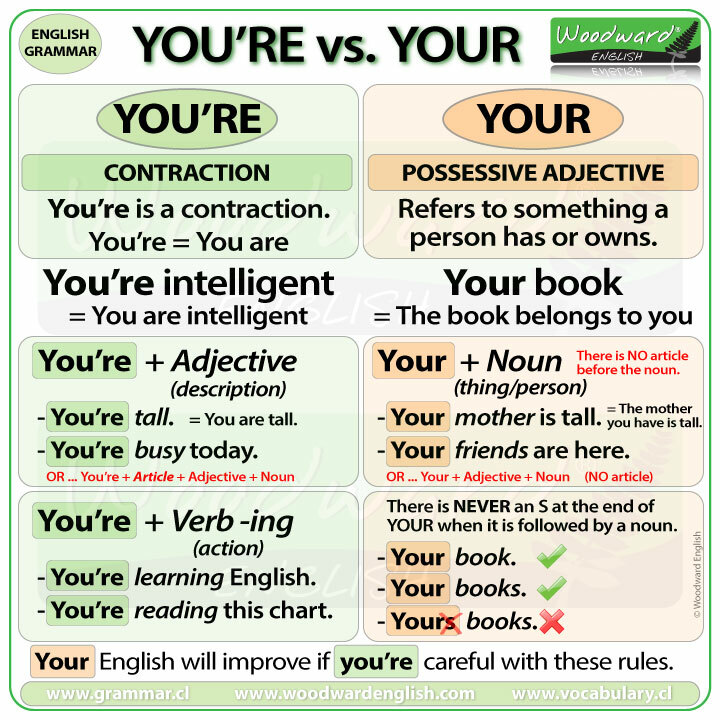 The first YOU’RE is a contraction of YOU ARE … and the second YOUR is a possessive adjective. How do we know when to use YOUR or YOU’RE? It depends on the next word or words. You have a ball. Your ball is red. Can I use your dictionary please? NOTE: There is no article before the noun. Sometimes there is an adjective before the noun. You’re = You are … is often followed by an adjective. NOTE: There is no noun after the adjective unless there is an article. You’re = You are … can be followed by a verb ending in -ING. You’re watching a video right now. You’re going to learn these rules. You’re = You are … can also be followed by a noun. Can you see the different uses? You’re learning English at your school. You’re happy your ticket won the lottery. YOUR or YOU’RE with a noun? See how the last sentence needs the article (a) before the noun (father). Remember, we do NOT add an S to the end of your with plural nouns. How can I remember the difference between YOU’RE and YOUR? 1. Replace YOUR with MY. If it sounds correct then YOUR is correct. If it doesn’t sound correct, then you need to use YOU’RE. MY crazy. (Sounds WRONG) … It needs to be YOU’RE crazy. 2. Replace YOU’RE with YOU ARE. If it sounds correct then YOU’RE is correct. If it doesn’t sound correct, then you need to use YOUR. YOU ARE bike. (Sounds WRONG) … It needs to be YOUR bike. 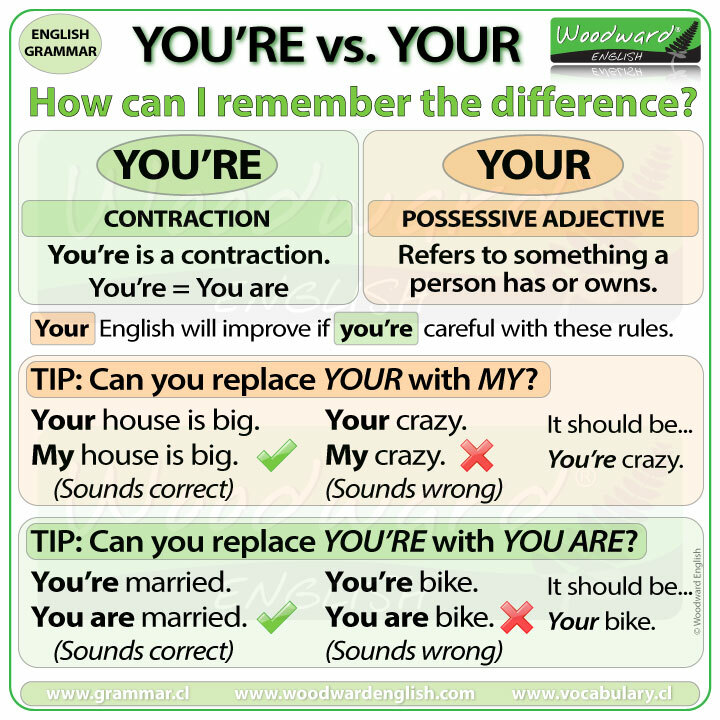 The difference between You’re and Your is a common mistake even for native speakers in written English so don’t worry if you find it difficult at the beginning.